US-Bangla Airlines has added a brand new ATR 72-600 aircraft to its fleet. 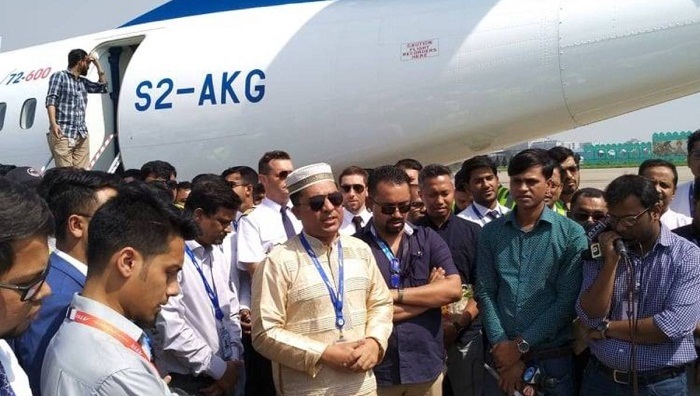 The aircraft which came straight from the factory in France landed at Hazrat Shahjalal International Airport on Sunday noon, said Imran Asif, Chief Executive Officer of US-Bangla Airlines. With this, the number of aircraft to the US-Bangla fleet has risen to eight, he said. The new ATR 72-600 aircraft which can fly at a speed of 510 kms per hour will begin its operation on domestic routes on March 31, Imran said, adding that three more ATR 72-600 aircraft will be added to the private airline’s fleet within a short time. With the slogan of ‘Fly fast, fly safe’, US-Bangla airlines started its journey in July 2014 and acquired recognition for timely flight operation, international standard cabin service, good quality catering service, comfortable seat and proper passengers’ service.